1 The prevailing inter-monsoon conditions in Singapore and the surrounding region are expected to persist through May 2019. 2 During the inter-monsoon period, the low level winds are generally light and variable in direction. There is also strong solar heating of land areas, and coupled with convergence of winds over Singapore and the surrounding vicinity, short-duration thundery showers accompanied by high lightning activity typically occur in the afternoons. 3 In the second half of April 2019, moderate to heavy short-duration thundery showers are expected between the late morning and afternoon on six to eight days. In addition, on one or two days, the passage of Sumatra squalls could bring widespread thundery showers and gusty winds in the morning. The rainfall for April 2019 is forecast to be near-normal. 4 Although thundery showers are expected on most days for the rest of April 2019, it is also expected to be warm. The daily temperature on most days is forecast to range between 25°C and 34°C. On a few afternoons, the daily maximum temperature could reach a high of 35°C. 5 For updates of the daily weather forecast, please visit our MSS website (www.weather.gov.sg), NEA website (www.nea.gov.sg), or download the myENV app, or the MSS’ Weather@SG app. 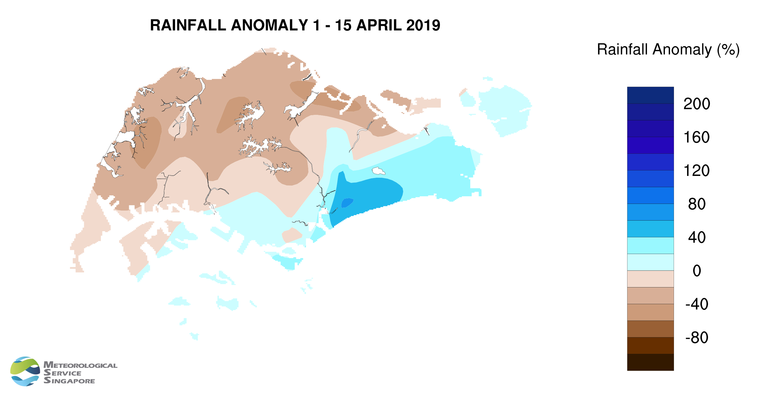 6 During the first half of April 2019, inter-monsoon conditions prevailed over Singapore and the surrounding region. The low level winds were generally light and variable in direction, and the monsoon rain band was located over the equatorial region. This brought wet conditions over Singapore and the surrounding region, a welcome relief from the prolonged drier and hotter than usual conditions experienced on most days since late January 2019. 7 In the first half of April 2019, light winds and strong solar heating of land areas led to the development of thunderstorm clouds on most days. Intense short-duration thundery showers fell over many areas in the afternoon on some days. The thundery showers over the Tai Seng area in the late afternoon of 10 April 2019 recorded 71.4mm of rain. This was the highest total rainfall in a day for the first fortnight of April 2019. 8 On a few days in early April 2019, the winds blew from the southwest or west, and Sumatra squalls moved over Singapore in the predawn hours and early morning. This brought widespread thundery showers and gusty winds over many areas of the island. The wind gust of 75.6km/h at Pasir Panjang during the passage of a squall on 3 April 2019 was the highest recorded wind gust for April 2019 so far. 9 Despite the wet weather on most days in the first fortnight April 2019, there were several days that were very warm with the daily maximum temperature rising to above 35°C. During the period, the highest daily maximum temperature recorded was 36.0°C at Admiralty on 7 April 2019. On most days, the daily temperature ranged between 24°C and 34°C. 10 More than two-thirds of the island received below-normal rainfall in the first fortnight of April 2019. The highest rainfall of 168.4 mm (67% above average) was recorded at Tanjong Katong. Rainfall was lowest at Choa Chu Kang where 52.6 mm (59% below average) was recorded.